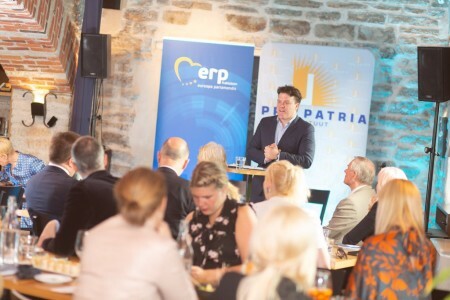 The Estonian Think Pro Patria Institute organized an international conference with the support of the European People´s Party in the European Parliament in Tallinn/Estonia. On 24th May 2018 I moderated a panel “new challenges of the Baltic region sea sister parties” in Tallinn/Estonia. With the campaign managers of Sweden, Denmark, Finland, Lithuania and Estonia we discussed the current hot topics in Europe and the aspects of regional cooperation. Can the Baltic Sea Region be a model region, pioneer for digitalisation within the entire European Union)? Efforts currently are made to expand information management cooperation between Finland and Estonia and the Nordic countries and to open up cross-border digital services for the entire Baltic Sea Region. Defence Ministers from Finland, Sweden and the United States just were scheduled to meet in Washington to discuss military cooperation between the three countries and the overall security policy situation. Sweden just gave out emergency guidance in the light of Russian aggression. The Baltic pipeline is to run from Russia via the maritime zones of Finland, Sweden, and Denmark. Finland recently granted a permit, with the other two pending. Its opponents, including Poland, the Baltic states, and Nordic EU countries, have said Nord Stream 2 would help Russia to cut gas supplies to Western allies, including Ukraine, for strategic reasons.